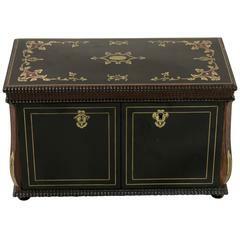 This early 19th century French Charles X period palisander box features a finely inlaid lemon wood border on its top and front. An inlaid central floral and leaf motif decorates the top. Used as a traveling sewing kit, this box includes all of its original contents, silver scissors and thimble, mother of pearl needle case, thread separators, and embroidery tool, as well as a crystal and bronze bottle. Each of the sewing accoutrements has its own fitted place in the green velvet platform of the interior. The removable platform lifts up to reveal a silk lined interior for additional storage of sewing supplies. The back of the lid is also fitted with a mirror. Includes one key with functioning lock, circa 1820.